Visual Studio Code>Other>Travis CI StatusNew to Visual Studio Code? Get it now. 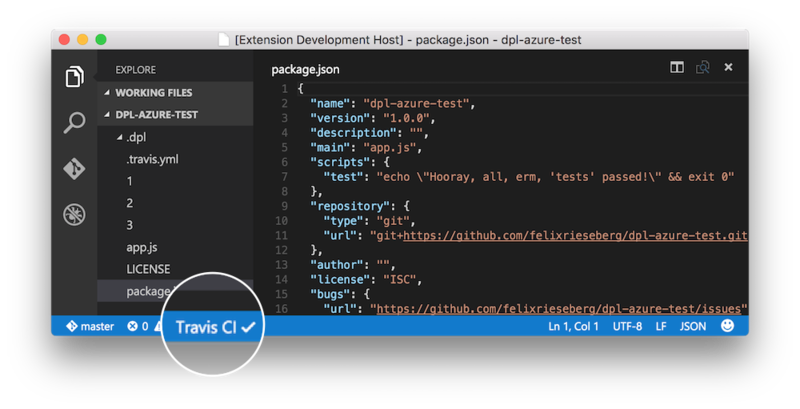 Check the Travis CI build status of your project right in Visual Studio Code! This extension displays a small status indicator in the status bar. It comes with two commands: Update Status and Open in Travis. It is enabled automatically if a .travis.yml is present in your project. Travis uses a username/repository combination to find your test. By default, the extension will atempt to gather that information from your Git configuration, using the origin remote. So, if your repository lives in https://github.com/felixrieseberg/bubblegum, the extension will expect to find tests at https://travis-ci.org/felixrieseberg/bubblegum. By default, this extension will request a status update from Travis every 60 seconds. You can easily override this by changing the your ./.vscode/settings.json file. Which will set the polling interval to every 30 seconds. It is recommended that you don't attempt to poll for status changes too often. MIT, please see LICENSE for details. Copyright (c) 2015 Felix Rieseberg and Microsoft Corporation.